The moral of this story is when Jimmie Johnson gets ticked off, he doesn't stay mad, he just gets even. And that's what the five-time NASCAR champ did here on a picture-perfect Sunday afternoon -- one week after that controversial black flag at Dover cost him victory, Johnson bounced back with a vengeance to win the Pocono Party 400. 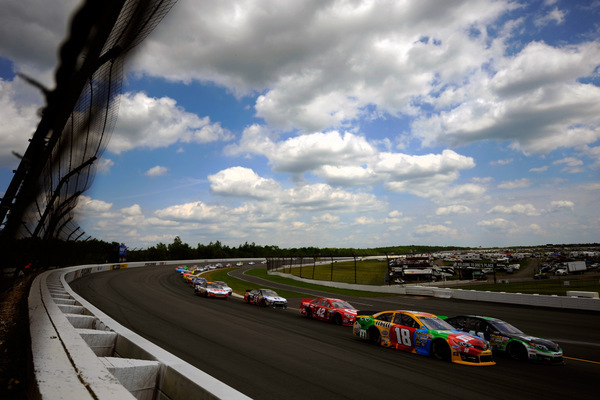 Johnson not only dominated the three-hour race at Pocono Raceway, just 90 minutes west of Manhattan, he led 128 of the 160 laps, in a car he called one of the strongest he's had in quite a while. "It was awesome on straightaways," Johnson said, almost gleefully. "It's been a long time since I won here. "We just had a lot of fun out there." Only a flurry of late cautions kept the field in sight of Johnson. The first two hours of the race went virtually caution-free, and Johnson took large leads. However Johnson had an odd vibration midway through the race, which worried him and crew chief Chad Knaus. It did not develop into a major issue, though. "I think we were spinning the left-rear on the wheel itself," Johnson said. "But it never got any worse." After the Dover restart controversy, restarts here were closely watched. Johnson, usually the leader, won most of them. But he said it wasn't easy: "On those restarts, there are only so many tricks you can use legally. And they were wising up to just about everything I was doing." The victory was Johnson's 63rd tour win, his third this spring, and it puts him 51 points up on Carl Edwards in the Sprint Cup standings...which means Johnson could skip next weekend's Michigan 400, lounge on the beach in Hawaii, and still have the points lead heading to Sonoma. Greg Biffle charged to second down the stretch, in somewhat unexpected run. "I didn't really have anything for Jimmie, but I wanted to get up to his bumper and rough him up," Biffle said. Biffle and teammate Carl Edwards have said their Fords are behind the Chevrolets and Toyotas. "We still have a little work to do on our cars," Biffle said again. "These guys are just a little faster. 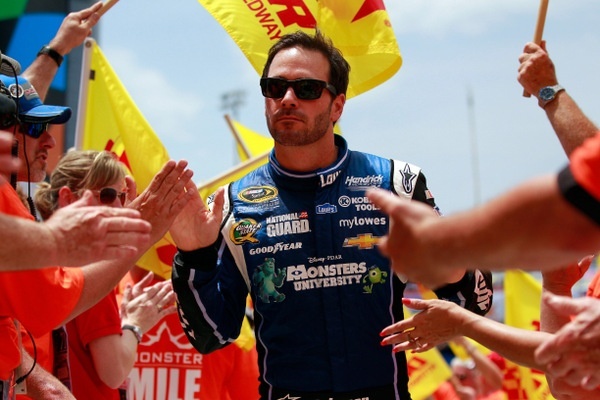 "I felt I was as good as Jimmie in turn one and the tunnel turn, but Jimmie was killing all of us in turn three. He's got something figured out over there. "Those guys (at Rick Hendrick's) clearly have the best stuff on the tour right now. "But we ran better here than we have all season, and that's good." Dale Earnhardt Jr., Johnson's teammate, had the second-best car most of the afternoon, and he worked the low line well on restarts. But Johnson was just too strong. And Biffle slipped by Earnhardt after the final restart, with four laps to go. "Just excited to run good," Earnhardt said, heading to Michigan this week, where he scored his last tour win, last summer. "We started this year off really good, but we've had some problems. But the confidence is there. 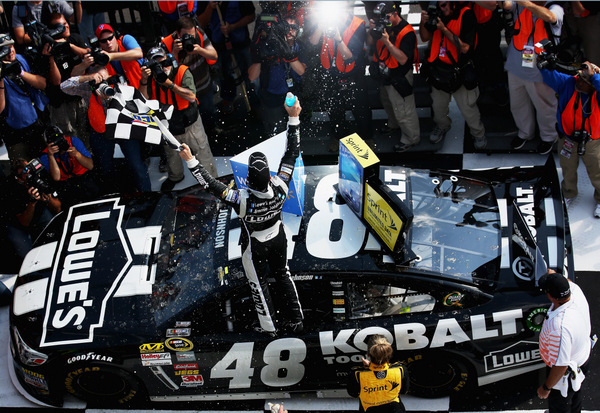 "We got close to Jimmie. But Jimmie was much faster in turn three, and that's where you've got to be fast. "The inside on those last few restarts was tough, because the guys behind could get a run on you." Ford versus Chevy versus Toyota this season? "I worried about going to the Gen-6, because everyone had a different front end," Earnhardt concedes. "But the Chevys are doing pretty good. Some teams may have a little more engine, but that's more 'organization' than manufacturer. "But really it comes down to handling, and Jimmie had the best handling car here." Well, there may be more to it than just that -- Rick Hendrick's engineering took four of the top five places, with surprising Tony Stewart and teammate Ryan Newman sliding home fourth and fifth. Toyota's Kyle Busch, Matt Kenseth and Denny Hamlin have had the strongest cars each week so far this season, but this time they all seemed just a half-step slower than usual. Hamlin, a big winner here lately, moved into contention midway, but he couldn't handle Johnson or Earnhardt. Kyle Busch finished sixth, and Hamlin eighth. Kenseth was also a contender until he was tagged by Juan Pablo Montoya. Kurt Busch was also very strong, but a slow pit stop was costly. He scrambled to finish seventh. -- Brad Keselowski has cooled off. -- Dale Earnhardt Jr. has cooled off too. -- Michael Waltrip's guys, though still winless, are picking up steam. -- On any given Sunday the men to watch are still Jimmie Johnson, Kyle Busch, Kurt Busch, Matt Kenseth and Kasey Kahne. -- Both Kurt and Kyle Busch, though hard-chargers and front-runners, have been plagued with minor but debilitating problems. -- Toyota teams are all strong, but quality control of parts appears an issue. -- The Toyota management shakeup does not bode well for Toyota teams deeper in the season. When the guy at the top quits suddenly mid-season, for whatever issue, that's not good. One thing to watch for now -- will Kyle Busch and Matt Kenseth continue to lead laps, or will Toyota go conservative. Already Denny Hamlin is giving signs of going conservative, though he realizes he will need to win two races between now and Richmond-September, probably, to make the playoffs. -- Mark Martin, so hot last season, appears to be fading. -- Matchups to consider: Joey Logano versus Matt Kenseth, Brad Keselowski versus Jimmie Johnson, Greg Biffle versus Carl Edwards. -- Man on the hot seat: Ryan Newman, needs sponsorship for 2014 and a contract. -- Tony Stewart's three-car team continues to struggle. How much of a drag is Danica Patrick? Those boos at Charlotte may have been unnerving, both to her and the whole team. Her performances this spring have been, well, terrible. And she is not showing improvement. NASCAR's continued heavy-handed promotion of Patrick may not be helping things either. And is Ryan Newman on the same page as everyone else? This looks like three teams all heading in different directions. Can Greg Zipadelli rein in everyone? -- Too many teams and drivers appear to be going into 'stroking' mode the past month. -- Race speeds continue to be a question, with these 2013s some five miles an hour quicker than last year's cars. Goodyear is so far generally sticking to last year's compounds, but that could soon change, given all the testing. -- The Ford question is looming larger. Even Ford's top drivers say they're worried they're missing something. -- Joey Logano, after a few years clearly under heavy pressure at Joe Gibbs, appears much more comfortable and confident at Roger Penske's, and the results are better now. -- Kasey Kahne, if he can avoid inconsistent runs, looms as Jimmie Johnson's biggest title challenger this fall....that is if Johnson doesn't just run away to yet another Sprint Cup championship. -- Questions continue to surround the Chip Ganassi-Jamie McMurray-Juan Pablo Montoya operation, which continues to underperform. And Ganassi's absence on race weekends only adds to the questions. Sunday's 400 was the first of six broadcasts by Turner's TNT cable network, the TimeWarner (read CNN) subsidiary. How did Fox do in its 13-race season?